The Journal of Asian Natural Products Research (JANPR) deals with chemical and pharmaceutical studies in the field of natural product research on Asian ethnic medicine and publishes work from scientists in Asian countries, e.g. China, Japan, Korea and India, including contributions from other countries concerning natural products of Asia. The journal has been indexed by Science Citation Index-Expanded since 1998, with a 2015 Impact Factor of 1.009 (©2016 Thomson Reuters, 2016 Journal Citation Reports®). The journal is also indexed or abstracted by Chemical Abstract, Chemical Citation Index, Research Alert, etc. Current Traditional Medicine covers all the aspects of the modernization and standardization research on traditional medicine of the world, e.g. chemistry, pharmacology, molecular mechanism, systems biology, proteomics, genomics, metabolomics, safety, quality control, clinical studies of traditional Chinese, Ayurvedic, Unani, Arabic and other ethnomedicine. Each issue contains updated comprehensive in-depth reviews along with high quality original experimental research articles. Current Traditional Medicine is a leading and important international peer-reviewed journal reflecting the current outstanding scientific research progresses of the global traditional, indigenous, folk and ethnologic medicine. It provides a bridge connected the tradition medicine system to the modern life science with the efforts of top scientists, as well as a resource to pursuit the solutions for the existing common issues in the traditional medicine. International Journal of Phytotherapy and Ethnobotany ISSN 4536-1835 is a peer-reviewed open access journal devoted to reporting the latest advances in phytotherapy and ethnobotany. 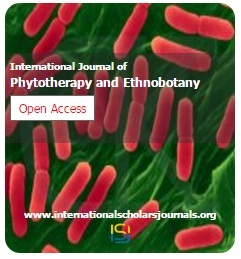 The goal of this journal is to provide a viable platform for scientists and researchers all over the world to promote, share, and discuss novel issues and perspectives in diverse areas of phytotherapy and ethnobotany and to keep track of the most recent methodological and theoretical developments in the discipline. All submissions are blind reviewed and those accepted are published online either immediately or at the earliest opportunity. American Journal of Ethnomedicine is an open access, peer-reviewed, bimonthly, online journal that aims to promote the exchange of original knowledge and research in any area of ethnomedicine. Background: Alzheimer's disease is a neurodegenerative disease related to memory impairments and neuronal cell death. Bozhougyiqi-Tang (BZYQT), a traditional herbal medicine, has been therapeutically used for the treatment of pulmonary tuberculosis. Objective: The aim of this study is to evaluated the neuroprotective effect of the fermented BZYQT and compared with unfermented BZYQT in HT22 cells by MTT assay and tested the beneficial effect on memory impairments induced by scopolamine (1 mg/kg, i.p.) using the passive avoidance and Morris water maze tests. Results: Compared with unfermented BZYQT, the neuroprotective effect of fermented BZYQT on glutamate induced neurotoxicity in HT22 cells increased at a concentration of 100 &#956;g/mL. Fermented BZYQT increased the step-through latency of the passive avoidance response. Furthermore, in Morris water maze test for evaluation of spatial learning and memory, escape latency time was significantly reduced by fermented BZYQT. Conclusion: These results suggest that the fermentation process of BZYQT led to improve neuroprotective and cognitive enhancing effect.